After losing his father to a stroke and watching two uncles give up on expensive treatment for the same thing, engineer Ban Ho-young sought to create a disruptive technology that would make rehabilitation easy and affordable for any patient. He and cofounder Choi Young launched Neofect to create a smart rehabilitation glove that helps doctors analyze patients’ progress while keeping stroke patients motivated by helping them regain their arm and hand skills through activity games. After four years of development, the team rolled it out for sale last year. The product, Rapael, has been sold to over 20 hospitals in Korea, and the pending home-use version could allow patients to continue therapy on their own between doctor’s visits for just 50,000 won a month. But Ban says his start-up and other medical-tech peers are squeezed by Korea’s legal gray areas, quick-buck investors and rising production costs. Tough health care regulations make new technologies difficult to introduce, especially when several government bodies are involved, he said. The lack of agreement about the privacy, ownership and use of private data, for example, prevents Neofect from analyzing big data from hospitals to determine the best-fit trends, which the CEO said could enhance research and treatment for both doctors and tech developers. Korea’s ongoing debate over telemedicine and remote health care is also hindering patients from using Rapael at home, Ban added. With today’s rehab methods, patients can lie about doing their home exercises, but Neofect’s technology makes activities easy to track, he explained. Having a doctor involved in the home-care version to communicate with the patient would be preferred, but Neofect is seeking to separate the two to work with the regulations, he said. Even while he sees that Korean consumers tend to be open to new technologies, the law is wary to adapt to them, and private venture capital funding even more so, Ban claimed. Despite schools like KAIST churning out top-trained engineers ― including Neofect’s founders ― Ban noted that medical hardware isn’t a hot segment in Korea like e-commerce or gaming, where Coupang and 4:33 Creative Lab are among the top-funded start-ups. Health care start-ups, which need lots of time and money for development, often struggle to get off the ground as local investors are wary of making long-term plays without promising data and in the face of unclear laws. They opt for faster results in mass consumer services, especially considering the relatively small size of Korea’s health care market compared to its economy, Ban said. According to the World Health Organization, Korea’s health care spending stood at 7.2 percent of gross domestic product in 2013, compared to 17.1 percent in the U.S. and 10.3 percent in Japan. Conditions are worsening for hardware start-ups of all types, as small factories are shuttering in Korea and moving to China, making small-order prototypes more expensive, he added. Time will tell whether Korea can produce a successful role model to pave the way for local health care innovators, as both the start-up and venture capital ecosystems are in very early stages compared to those in the U.S., Ban noted. The government seems to be filling in the financing gap with grants and the Tech Incubator Program for Startup angel investment-matching fund, he added. 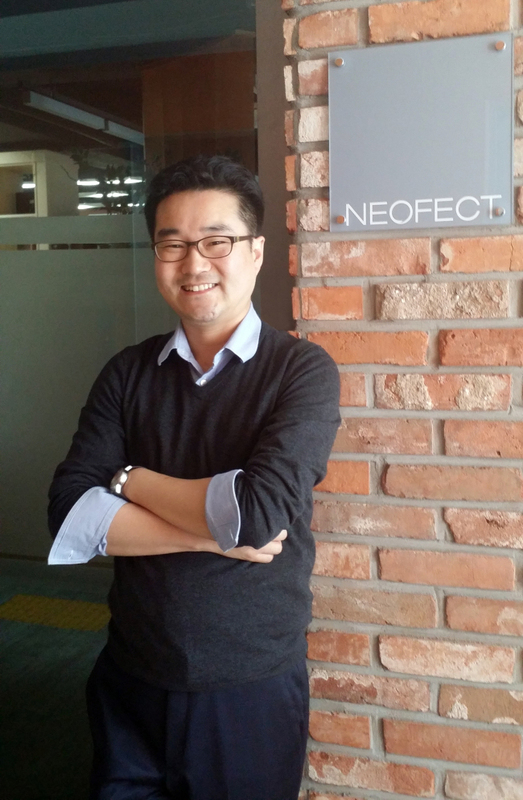 Conditions for private funding could improve in some 10 years, he said, but Neofect won’t wait for Korea to catch up. It is targeting sales of Rapael’s business-to-business product, which runs at around $10,000, in Europe, the U.S. and China. Neofect also incorporated in San Francisco to seek out a strategic investor and foster its network in the U.S.
For more information, visit neofect.com. Start-up Seoul is a series featuring figures in Korea’s emerging tech start-up scene. This is the 17th installment. ― Ed.